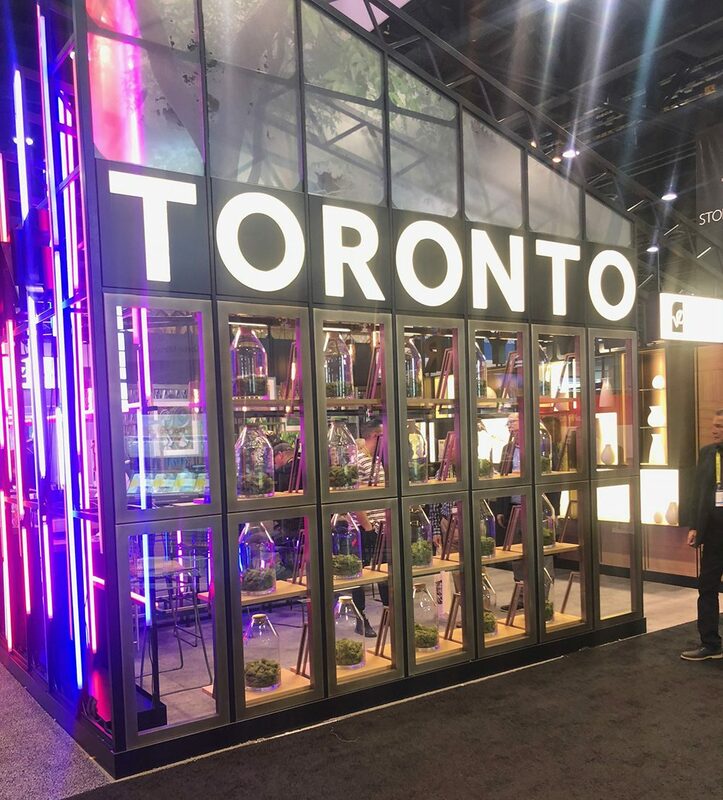 Globalshop returned to the Windy City for 2018 after a 4 year run in Las Vegas. Chicago has always been one of my favorite cities, and it was this show, 18 years ago, that was my first business trip. I have been a designer within the retail industry for most of my career, and with the media attention surrounding the “retail apocalypse”, I wanted to understand what the industry was saying. I landed in Chicago on the first day of the show and made my way to the W-Hotel City Center Chicago thanks to Lyft and a 25% discount code. From there, I headed to the McCormick center and arrived at around 2 pm. My intention for the first day was to get “the lay of the land”. I walked around the show and gravitated towards some booths that caught my attention. One of my first stops was Harvest Creative, an agency based out of Memphis, Tennessee. Their booth had a very retro cool “saloon” feel, and a sign that read “Retail is Not Dead”. As I entered the booth, I was immediately welcomed with “Would you like a drink?” They called it “Harvest Hour” and with true southern charm, they nailed it. 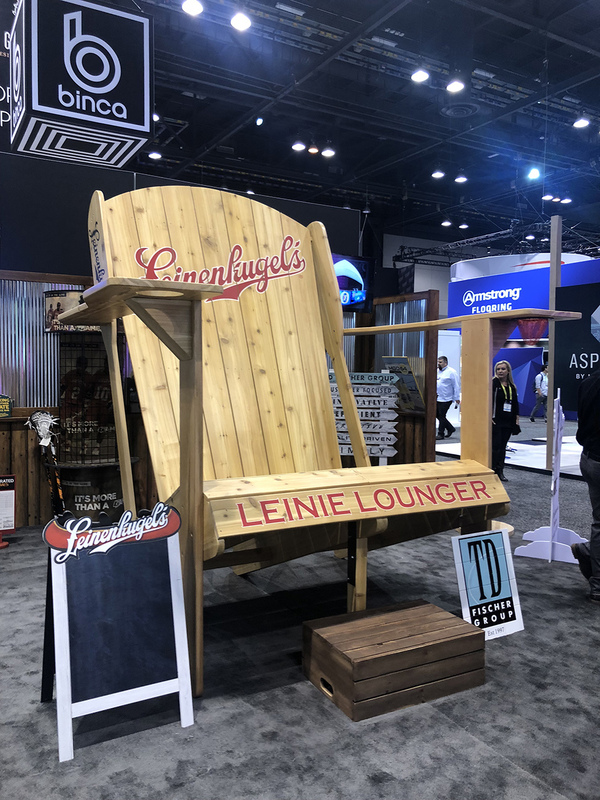 Typically, at tradeshows, there is so much focus on pedaling services or product that the basic rules of hospitality are forgotten. 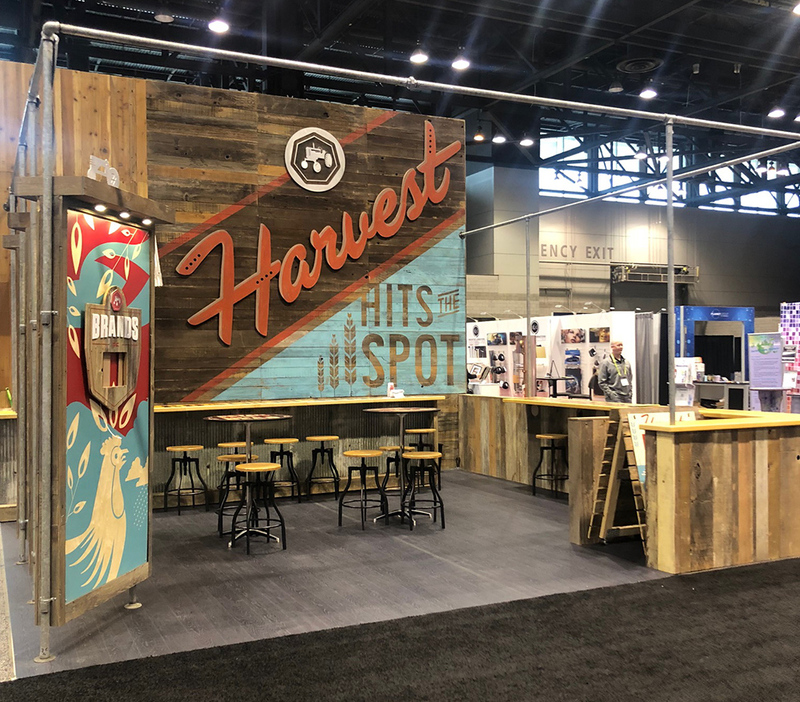 But thanks to the team at Harvest Creative, my first impression of Globalshop 2018 was an amazing one. After a quick chat, I wandered around the show drink in hand and with a smile on my face. I made note of the booths that I wanted to visit on the following day. I noticed a lot of companies had used materials like falcon board and other corrugated materials to create their booths. A few advantages of using these materials are cost, simplicity of assembly and that on tear down the booths get destroyed and tossed away (hopefully recycled). Many of these companies were using these materials to demonstrate their capabilities. 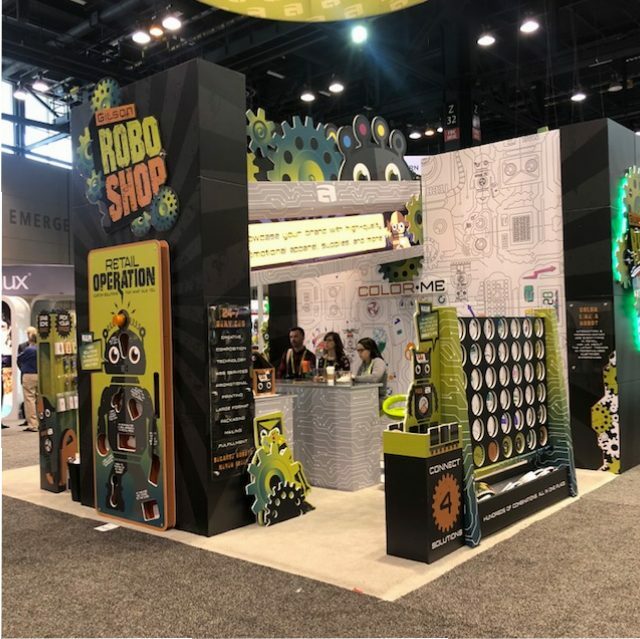 A standout was The Gilson RoboShop, a complete display with awesome graphics and interactivity with a full sized Connect 4 game and giant video screen with demonstrations – it wasn’t hard to see why they won the Best Booth Design Award. 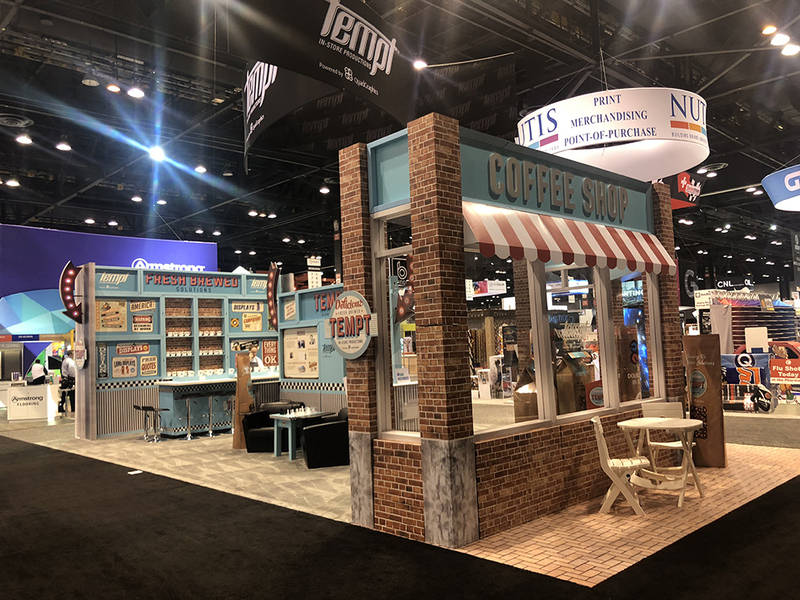 Another great example was Tempt In-Store Production and the “Coffee Shop”, an entire booth made from temporary materials. The graphics had great impact, but that impact would have been lost if they had not served coffee. It opened every morning at 10:00 am and served Espressos, Cappuccinos and Lattes. They were only missing the biscotti (perhaps next year). As the last hour of Day 1 come to end, I heard some music coming from a few booths away. As I got closer I saw it was coming from Triad Manufacturing, a major store fixture manufacturer based out of St. Louis. For the second time that afternoon, I was welcomed into a booth with not only a full bar, but catered food. I wasn’t asked where I was from, who I worked for or how many store fixtures I bought last year, it was simply come on in and enjoy. I made some great new contacts that day and was invited back for the next day’s Happy Hour. I want to commend the principals of Triad, as their staff all appeared happy and enthusiastic. 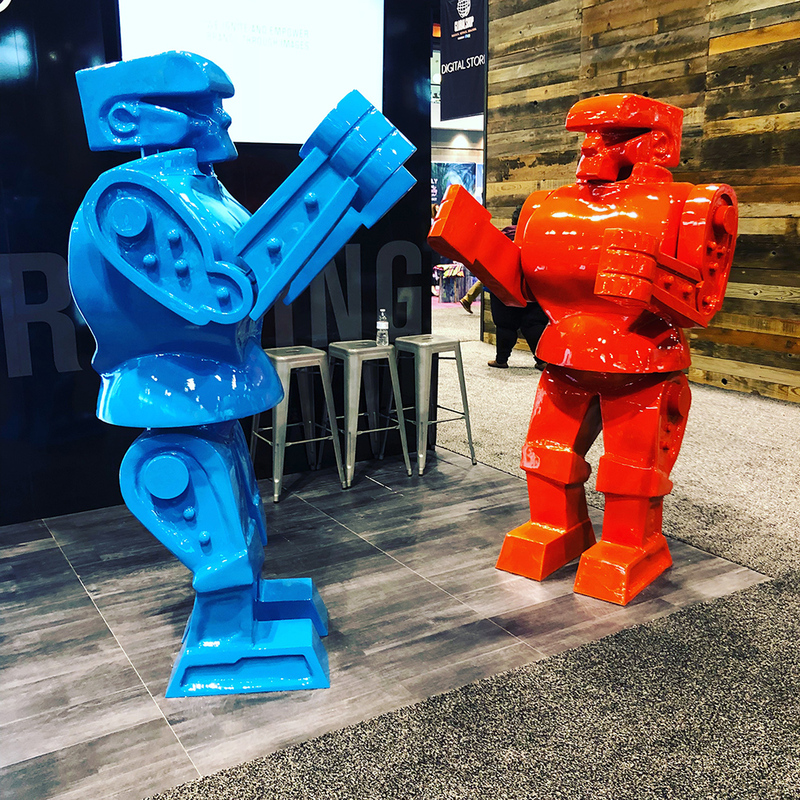 I think this is a true reflection of the ownership, as tradeshows like this can be a great time to motivate and engage with staff outside of the office setting. By the way, did you know that Triad has over 2 Million square feet of manufacturing? I have some ideas for your next booth, let’s chat, the drinks are on me this time. Understanding consumer behavior has a major impact on how retail is changing. We want to be understood, we want to talk to an expert and we want to feel welcome and engaged. The cluttered stores of the past are being replaced with lounges, coffee shops, demo areas and pop-ups. Retail is not dead…it’s finally getting better. I started Day 2 in the OMA (Outstanding Merchandise Awards) section. In this area, companies would submit displays in various categories. There were several nice displays. I’m drawn to designs that are impactful, clever and use materials in cool ways. The rest of the day was spent meeting with contacts and colleagues, gathering some new suppliers, getting some cool ideas and having some fun. For your viewing pleasure, I have posted my gallery, and I would love to have your feedback on it. 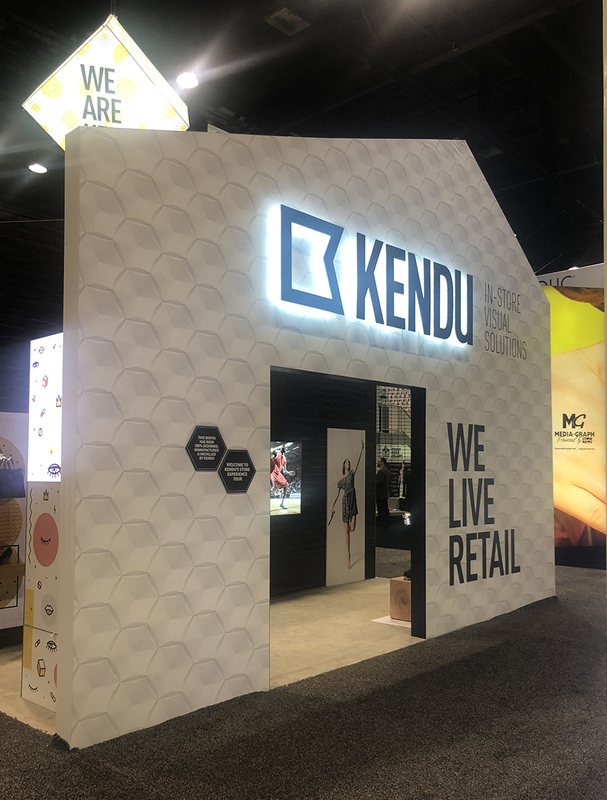 Kendu In-Store Solutions is a company based in Spain, with US locations in New York and Miami. Over the last few years they have made giant inroads in the industry. They work with some of the world’s top retails brands. 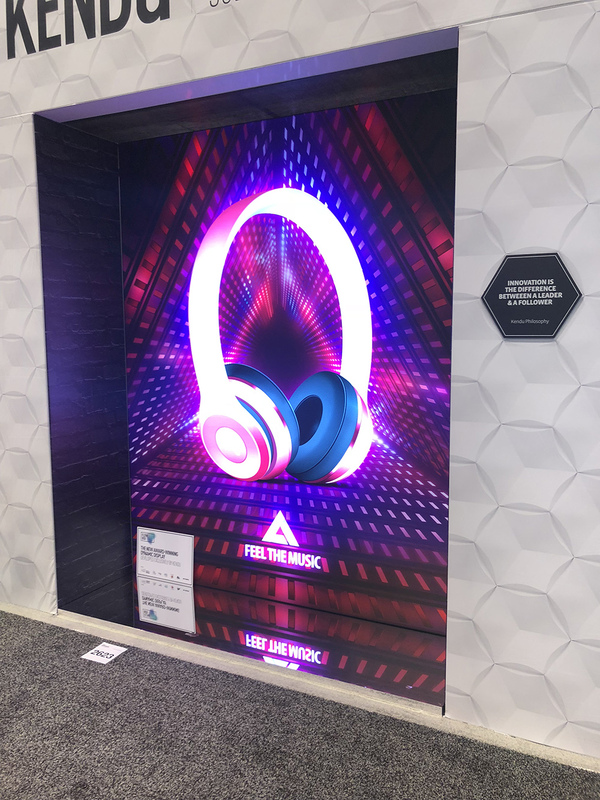 Their space at Globalshop was at the center of the action and was highlighted by the their Flowbox. 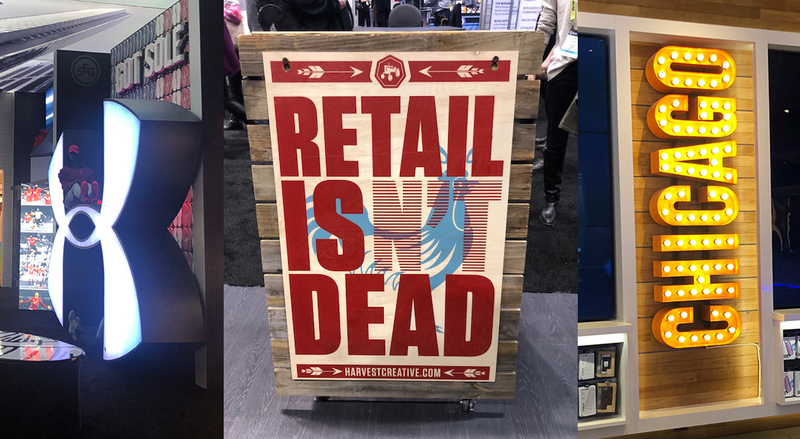 At almost any angle you could read the words “We Live Retail”, and this was truly evident from their booth, which received an Outstanding Booth Award from VMSD magazine. Another award wining booth was Visual Elements, based in my home town of Toronto, which won both a Booth Design Award and Best in Show. Their booth was another example of how consumer behaviour has changed. As I walked toward the booth, I noticed the bright “Toronto” sign on one of the sides, and without hesitation I took out my phone to take a photo. As I took a few pictures, I heard a voice saying “You must be Canadian” and an exhibitor from the next booth told me that every Canadian that walked by took a picture. The other three sides featured Paris, New York and Hong Kong. I probably would have included Chicago. Not too long ago, pictures were not allowed at Globalshop, especially in the OMA area, but social media has changed the way we interact. With Instagram having become a major part of our culture, setting a stage for people to take photos has become a trend. Globalshop now also has its own App, with an interactive map, a list of exhibitors, the schedule of all keynotes with notifications and even a scavenger hunt to find the “Golden Ticket” worth $200, in a booth – I’m sad to say that I didn’t win, but it was fun playing. Along with that is our fascination with anything that is larger than life. 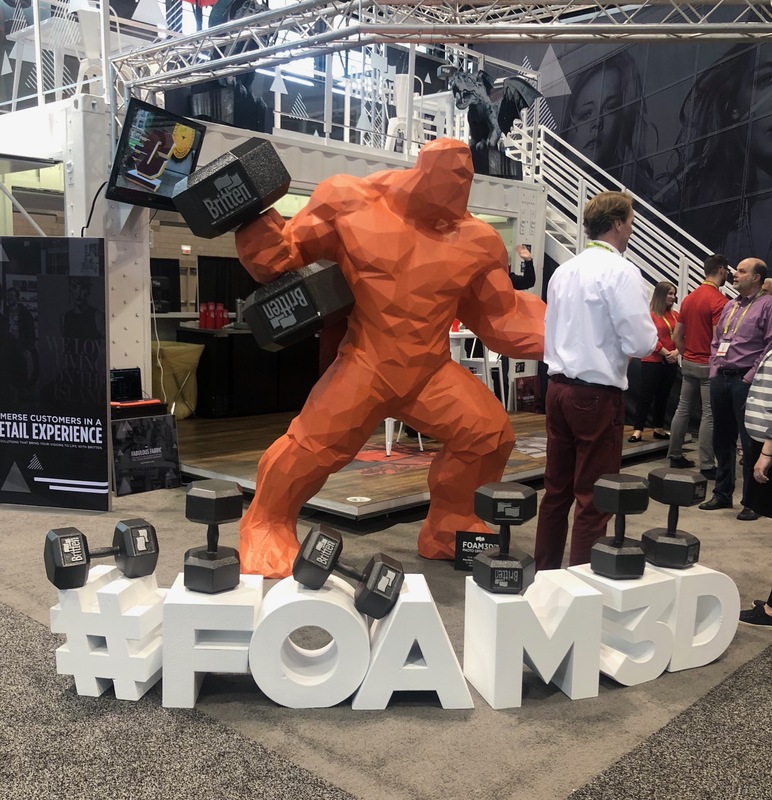 Three companies that demonstrated this trend were TD Fischer Group with their oversized Adirondack Chair (Muskoka Chair for us Canadians) Britton with the #FOAM3D Orange weightlifting monster and Eclipse 3D with their cool Rockem Sochem Robots. Before heading back to the Triad Booth for Happy Hour, I stopped by Rapid Displays to see the magic display called FLY VISION. This cool display hovers product in what appears to be mid air. The featured merchandise included a Michael Kors purse, a bottle of San Pellegrino and 3 bottles of Polo Cologne. There was a lot of intrigue around this display as people looked on and speculated about how it worked. Watch the video and let me know, what do you think? I spent my last day in Chicago touring some stores on Michigan Avenue, which I will post more about later, and feeling that my trip to Globalshop 2018 was a success. Most of the exhibitors and attendees who I talked to had positive feedback as well. Next year’s show will be held in Chicago again from June 25 to 27 under a new banner called RetailX . June in Chicago will certainly be warmer, making those walks along the Magnificant Mile even more enjoyable. As much as I enjoyed knowing which car service you took and the amazing discount you received on the ride, I am shocked that a smart sophisticate such as yourself would not provide a link to your unique Lyft code which will give you $5 in Lyft ride credits for every new signup. I could not read past this sentence in your blog as this lack of money saving savvy was quite rattling to me. Having said that, I will leave you with a positive note: I scrolled through your Instagram and think you are very good looking, are the perfect height, and have just the right amount of arm hair. Hope to see you at a future Globalshop gathering!